Ojai has two major claims to fame: the wines produced in the region, and the fact that is was the setting of the movie "Easy A" starring Emma Stone. It's a small town situated just north of the sleepy beach town of Ventura, and just south of Los Padres National Forest, in a valley with mountain views in all directions. Shops and wine tasting rooms line the main street through town, just waiting to take all your money in exchange for delicious-smelling candles and healthy pours of reds. So naturally, it sounded like the perfect place for a girls' weekend getaway. If visiting for a quick weekend, there are a few things that most definitely shouldn't be missed. 1. Try the wines! Let's be honest, isn't that the main reason why you were going anyway? Topa Mountain was an incredible spot to start our wine tasting adventures - it's just a short walk outside of town, and the venue has a quaint feel with tons of outdoor seating and live acoustic music. Then head downtown to The Ojai Vineyard, a tasting room right downtown with one of the best reislings I've ever had. 2. Have a tarot card reading. We had a lot of fun with this one. We decided on a whim that we'd have our tarot cards read "just to see what she says." I wish I had grabbed a business card from this woman, because she was so sweet and she was quite incredible. I know there are skeptics out there, so I'll just say this: the cards I got would not have made sense for my friend, or vice versa. And it was just...fun! If you're interested in finding her - look for a little knick knack shop just north of Su Nido Inn on N. Montgomery Avenue - maybe she already knows you're coming! 3. Hang out for the pink moment - The "pink moment" is a phenomenon for which Ojai is known - that moment when the sun hits the mountains and the surrounding atmosphere just right and turns everything a beautiful shade of pink. I think we may have seen an exceptional "pink moment" while we were there, and we just happened to catch it! Don't take the chance we did - check out the general time for sundown and make sure to be outside so you don't miss this spectacular moment of rosy hues. 4. Get some tacos at The Nest. Not that much need be said about this one - these tacos. Were. Incredible. And they're vegetarian! Don't get me wrong, I love meat, but these tacos were really to die for. I'd drive all the way back to Ojai for these. Definitely get the cauliflower tacos, and the brussel sprouts tacos. And then treat yo' self with an order of bao buns, too. 5. Go olive oil tasting. There are places in the mountains of Ojai where visitors can tour the olive oil mill as well as visit the tasting room, but I was quite impressed with my visit to Carolina Gramm's downtown olive oil tasting room. Carolina, an Italian living in Ojai, now imports olive oils from her home country and infuses them with herbs and florals from her personal gardens. I walked out of her tasting room with two olive oils and one balsamic vinegar simply because I couldn't decide which one was most delicious. Ojai was the perfect place for a quick girl's trip. And it's close enough to the LA area that it can absolutely be done in a day! But who doesn't wanna get a little wine drunk while the sun sets over those mountains? 1. It's usually the cheapest way to get around a city. This may seem like a no-brainer, but come on. A week-long subway pass in New York cost me $32. I probably used the trains 6-10 times a day while I was there. If I had tried to use Uber or Lyft, I could have easily spent $32 on one ride from Manhattan to Brooklyn. If you're a traveler on a budget, public transit is almost always the way to go. 2. You get a glimpse into the everyday life of locals. Locals take the trains, and the buses and the trolleys. When you take public transit, you sit alongside the people who live and breathe the city you're exploring. You notice new languages, trends of footwear, ways to carry belongings, or whether people read, or listen to music, or just gaze out the window. And by observing the locals, you're observing the heart of the very city you're in. 3. It helps you understand the geography of an unfamiliar city. When you're constantly looking at transit maps and routes, you quickly determine which way's north, and which way's south - and which train or bus lines run east - west or do a loop around the center. And let's face it - it's much harder to get lost when you know (generally) where you're going. 4. It's environmentally friendly. Taking the train with hundreds of other people is definitely more eco-friendly than having that UberX to yourself. And heck, walking is even better! 5. It makes you a better traveler. I'm a firm believer that those who travel earn a certain kind of knowledge that can't be taught in a classroom or read in a book, or even shared from one person to the next. This kind of knowledge is first-person only, and it bolsters your common sense and problem-solving abilities. It beefs up your will to understand and appreciate a city, a culture, a history. And the interactions you have asking that friendly but distracted woman on the subway platform if you're getting on the train in the right direction will make you a better traveler. The frustration you feel when you realize the train you're on is click-clacking over the Williamsburg bridge, when you had no intentions of heading to Brooklyn at all, will make you a better traveler. The satisfaction and relief that you feel when you take your shoes off after a day of walking up and down the side streets of an unfamiliar city will make you a better traveler. Take the train. Or the bus, or the ferry, or the tram or the trolley. You'll open your eyes to a part of the city you'd otherwise have never seen. I've visited the cozy little mountain town of Idyllwild more that a few times - it's one of my favorite places to camp, or snuggle up in a cabin with a fireplace. The downtown area is just adorable, with an old-fashioned candy shop, a few places to grab a coffee or a muffin, and of course a sprinkling of tourist trinket shops here and there. Wander your way to the outside of town and it's highly likely you'll find yourself at the beginning of a hiking trail that, if followed, will meander through large pines and through silent patches of forest, interrupted only by twittering birds. It's a fabulous place to spend a weekend away from the city. But it's not the scenery or the mountain air that makes Idyllwild my favorite destination just outside of Los Angeles. It's not the outdoor eateries or the homemade beef jerky, either. It's the mayor. The mayor of Idyllwild is a golden retriever. 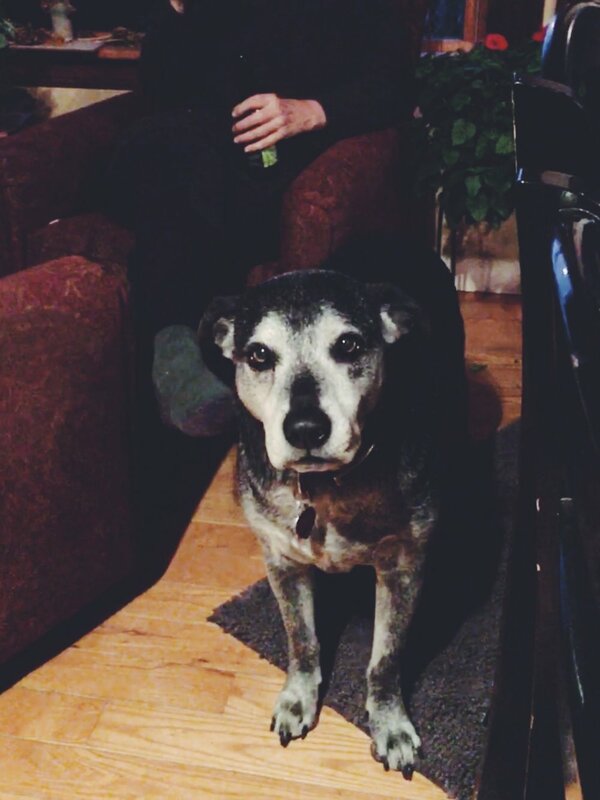 His name is Max. And if you don't happen to catch Mayor Max making a public appearance, you can call his chief of staff to arrange a meeting with him. During your meeting, you can discuss matters of local economics, or perhaps the status of funding for the annual holiday tree lighting. Or you could, ya know, just give him some belly rubs and share some vanilla ice cream. Since the city of Idyllwild is not technically incorporated, there was no mayor for years. But in 2012, voting was held for the position - and for one dollar per vote, residents and visitors alike could vote for the candidate of their choice. All funds were donated to the local animal shelter. Mayor Max I was elected to his position on July 1, 2012, but unfortunately died in office before the end of his term. But the transition of power was made seamlessly to Mayor Max II, who has held office ever since. In the name of democracy and head scratches, I encourage everyone to visit Idyllwild and arrange a meeting with Mayor Max. Shake some paws, take some photos (he knows how to take a selfie), and post-meeting spend your days hiking, sipping a hot mocha, or cozy-ing up next to a cabin fireplace. What more do you need? With a new year around the corner, it's time for a new wanderlist. I managed to check off four of five destinations from last year's list, and I'm aiming to go five-for-five in 2018! Check out where I'm planning to go while we're on our next trip around the sun. Colombia & Ecuador - Guys - this never happens to me, but I won two FREE round-trip tickets anywhere JetBlue flies through a sweepstakes! So you can bet I'll be showing them the love when I take them up on a flight from LA to Bogota, Colombia in 2018. I plan to spend a few days in and around Bogota, and then head to Cuenca, Ecuador to visit my beloved host family and the mountain town that will forever have a place in my heart! To say the least, I'm thrilled to head back to South America. St. Paul, Minnesota - I'm a born and bread Midwesterner, but I've never had the pleasure of venturing to the Twin Cities. Minneapolis made Conde Nast Traveler's "Best Places to Travel in 2018" lists already, many citing the awesome brewpub scene, 13 James Beard Award semifinalist restaurants, incredible city parks and more. I'll be heading to the Super Bowl LLII host city for a wedding in July, but you can bet I'll make time to see the sights once I can retire the bridesmaid dress and heels! Catalina Island, California - Catalina island is less than 25 miles south of Los Angeles, but the fact that it requires a ferry ride to get there has kept me at bay for three years. But I declare 2018 the year that I'll make the aquatic adventure to this little rocky island with a quaint harbor town. Tijuana, Mexico - Stop - don't panic! 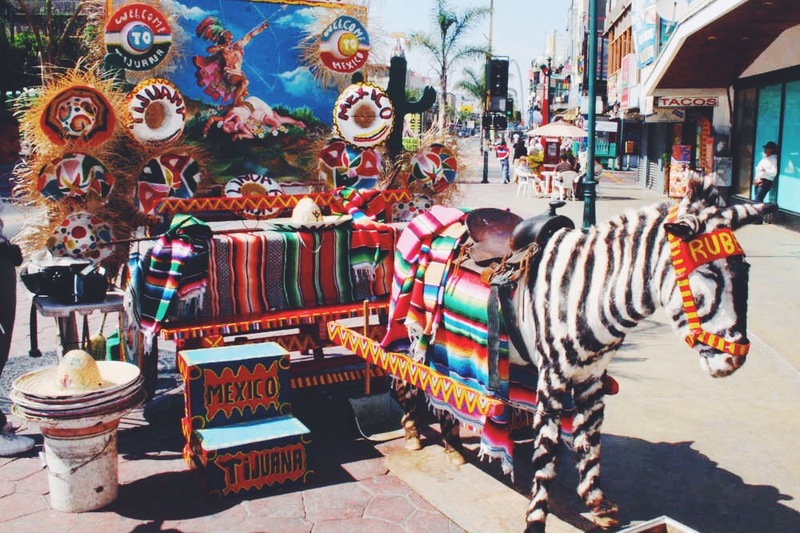 Tijuana is not the drug-warred town it was 20 years ago. This little city across the border is finding it's feet in the tourism industry once again, and I want to see it before it booms. New hotels and hostels are popping up, as well as restaurants and gastro pubs often touting "nuevos clasicos," or "new Mexican" classics. Not to mention, a trip south of the border would help me practice my Spanish before heading to South America! Ojai, California - Ojai is another Southern California gem that had evaded me thus far. The little foothill town is known for organic farmer's markets, vineyards and wines, and panoramic mountain views - perfect for a girls' weekend getaway to relax with a massage and a glass of Syrah! Where will you go in 2018? Any tips or suggestions for my 2018 wanderlist? If so, leave a comment below! In any given year between 1938 and say, 1975, road trippers heading "out west" would have driven their Pontiacs, Chevrolets and Plymouths down the two-lane, sometimes winding and climbing, ever-popular "Main Street of America" called Route 66. Along the way, they would have filled up gas tanks at service stations and chowed down at diners in towns called Ash Fork, Glenrio and Winona. Today's travelers bypass these little towns and roadside stands in favor of a faster, smoother ride on the interstate, but Historic Route 66 - and all the towns it supported - are still there. While driving back to Los Angeles from Flagstaff, Arizona, my boyfriend and I stopped in the western Arizona town of Kingman to use the bathroom and buy a fishing pole (I know, don't ask). We were hoping to stretch our legs and asked the employee at the sporting goods store if there might be any good hikes nearby. 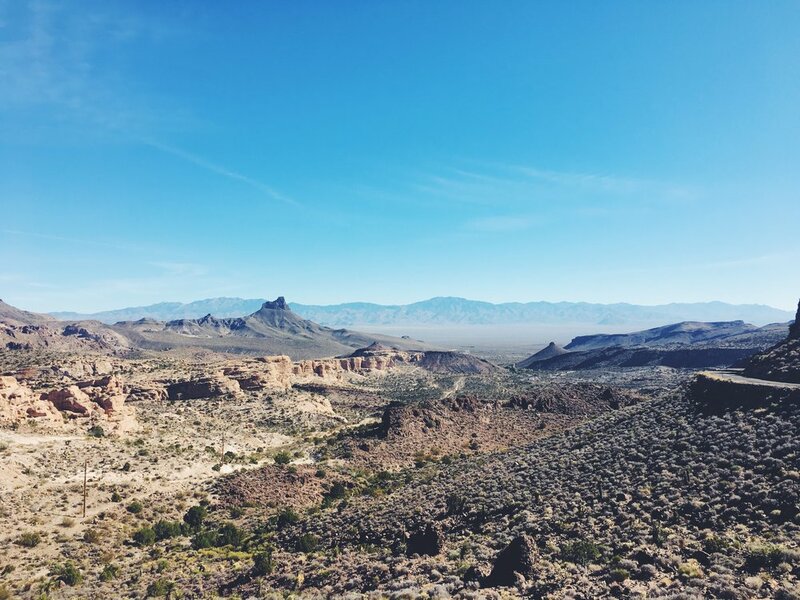 He nonchalantly mentioned a town called Oatman not too far from there that would have some trails for us to explore. Some shops and restaurants, too, he noted. On a whim, we took his advice, and headed on our bypass. What we weren't expecting was to find ourselves on Historic Route 66, heading up and over a mountain rage as the desert unfolded behind us. We stopped at Sitegreaves Pass - we'd later learn that California, Arizona and Nevada are all visible from the pass - to get out for a quick hike. What we discovered was actually a hillside memorial site for loved ones, both human and furry. Crosses and headstones were dispersed over an area of a few hundred square feet, some with trinkets, flowers, or even beer left behind by loved ones. We continued on our way down the mountain and to the town of Oatman, Arizona, which happened to be bustling with Thanksgiving weekend tourists, likely also on their way home. Today, the town of Oatman is a tourist trap, with t-shirt shops and trinket stores. But the unmistakable character of the gold mining boom town of 1915 is still there. Situated smack dab in the middle of the thoroughfare, the Oatman Hotel is the oldest two-story structure in Mohave County. The hotel loves to remind guests that it housed Clark Gable and Carole Lombard on their honeymoon in 1939, and in fact, guests can still peek into the honeymoon suite, with a neatly made brass bed and other items of the time decorating the room. 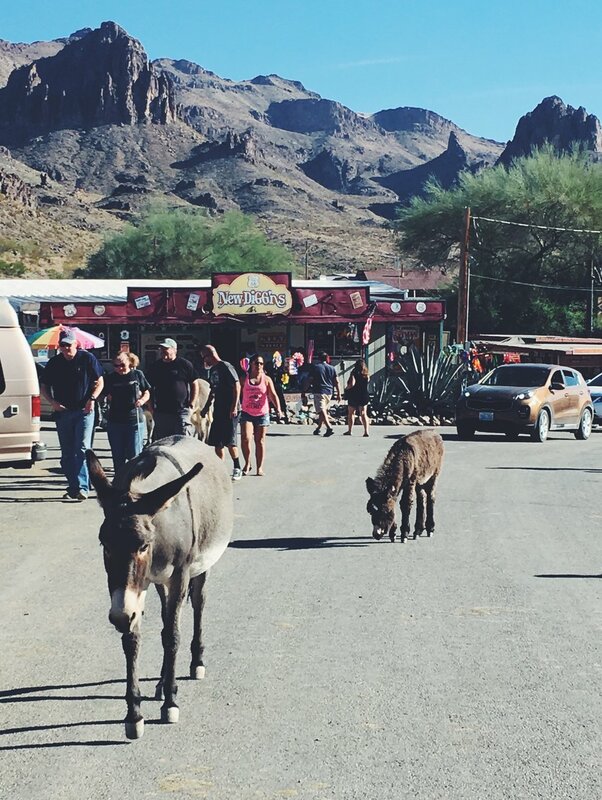 Oatman is also known for the burros (or donkeys) that roam the streets of town, knowing they'll receive a handout from tourists as long as they're hungry. When the locals are able to clear the main street of both cars and burros, they put on a street theater gun show in the style of the old west cowboys. Something special happens when you veer off the fast and convenient freeways in favor of the historic and scenic byways of America. Sure, it may take you a few more hours to get to your destination, but wouldn't you rather enjoy the journey of getting there? Without our detour through Oatman, we would have missed hand-feeding burros, jumping at the sound of each shot during the gun show and eating lunch in a restaurant almost entirely covered in signed dollar bills. We would have wizzed past the desert views without really seeing them. Instead, our trip down Route 66 took us back to the golden age of the American road trip - when it wasn't so much about how fast you can get there, but more about the fun you had along the way. Ever since moving to Los Angeles, I've found that I'm most homesick when October rolls around, and my hometown in Northwest Ohio would have a chill in the air and color on the trees. I grew up going to fall bonfires and drinking hot apple cider, fully embracing fall and everything that comes with it. In Los Angeles, fall feels pretend - and maybe because it is. The city that I love every other time of the year feels like it's putting on a front - the pumpkin spice lattes and fall decorations are there, but the essence of fall just...isn't. So when my best friend announced she'd be getting married just 30 minutes away from Asheville, North Carolina in October, I decided I'd need to take a few days to explore the trendy mountain town and soak up as much fall as I could in a few short days. I didn't have to look far to find fall - I left Hendersonville, North Carolina with all intentions of taking the very long and incredibly scenic route. Asheville sits just 30 minutes north of Hendersonville on the most direct route, but I instead headed about an hour out of my way in order to drive through Pisgah National Forest before merging onto the Blue Ridge Parkway. The mountain switchbacks weaved through vibrant fall forests, over creeks and across mountain peaks. Around each bend I found a new and equally brilliant fall scene, and each time I parked my car to snap a photo I was astounded at the beauty. I could have driven the parkway all the way to it's end in Virginia, but I was upon Asheville before I knew it. The little town of Asheville has a big - and I mean big - craft brewery and food scene. I dined on some seriously incredible jambalaya at Mayfel's, and tried a beer "from the Funkatorium" at Wicked Weed Brewing. At One World Brewing on a Sunday night, the bartenders and I played a few rounds of Scattegories. My Airbnb host and I had dinner together at Corner Kitchen - she sold it to me by stating with pride, "That's where they took Obama when he was visiting Asheville!" She pointed out his photo on the wall as I dug into my squash-stuffed chicken breast and couscous. After several word-of-mouth recommendations, I decided to spend a day exploring the Biltmore Estate on a self-guided tour. The Biltmore is America's largest privately-owned home built by George Vanderbilt and completed in 1895. The home has over 250 rooms, those of which include a dining hall that could rival a set on Game of Thrones. But the Châteauesque-style mansion is just the beginning of what the Biltmore has to offer - after touring the massive home, I explored the rose gardens and expansive greenhouses, as well as the working farm and America's most visited winery. Fall was a beautiful time to visit, with the home already decorated for Christmas and multiple Christmas trees in each room. One evening, I drove to the Grove Park Inn (again, at the recommendation of my Airbnb host). She described the inn as looking like a big "hobbit home," with giant fireplaces on either side of the lobby. She said it would be a great place to sit and have a glass of wine on a dreary, snowy night like it was. She sold it well - and the hotel was beautiful, with a massive sloping red roof and stone facade (giving it the hobbit vibe), and sprawling views of the Asheville mountains. I snacked on Bison meatballs and sipped on Cabernet Sauvignon while the fireplaces crackled in the distance. A lot of what makes me homesick for fall in the Midwest is family. I think of having fires in the backyard, and making trips to the pumpkin patch together. Or making pumpkin cookies with my grandma and eating half of them immediately afterward. But my time in Asheville sure felt like I was with family. Staying with Paula and her dog Levi at The Dragonfly Cottage felt like staying with an Aunt I hadn't seen in some time. 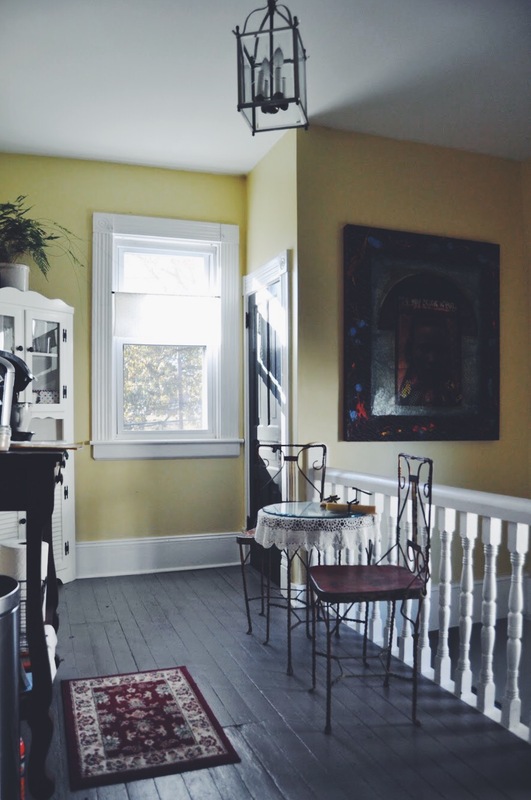 She gave me recommendations for what to see and do, she welcomed me into her living quarters and poured me a glass of wine as we talked about life's ups and downs. When I checked out of The Dragonfly Cottage, she said with her sweet Alabama accent, "Well you come on back now with that boyfriend of yours, girl. It sure was a pleasure havin' ya." It was her warmth that made fall in Asheville so cozy. I sure found fall in Asheville, and all of the colors, smells, sounds and feelings that come with it. I hope I'll be back someday, perhaps the next time I'm feeling fall withdrawal out here in Los Angeles. Until then, I'll be reminiscing through my photos, which you can see here! As my client* likes to say, "You haven't been down under until you've been outback." And after visiting Australia's Northern Territory, I couldn't agree more. Though admittedly, the outback isn't necessarily easy to get to - but don't let that deter you. Australia's big cities and welcoming coasts are beautiful, clean and accessible, but the outback is true Australia. It's not to be missed. First, where you fly into depends on how much time you have available. Almost all flights from the U.S. will connect in a coastal city, like Sydney, Melbourne or Brisbane. From there, if you only have 2-3 days to spend in the Northern Territory (NT), fly into Ayers Rock (AYQ). The airport is small and only has a few flights a day, but it's practically in the shadow of Uluru (Ayers Rock), so you're just a short drive away from the hotels and main attraction. If you've got a bit more time to spend in the Northern Territory (NT), cruise on into Alice Springs (ASP) and take a day or two to explore the outback town before driving down to Uluru. Uluru. Let's be real, this geological wonder is the reason why most people make the trek to the outback. Previously called "Ayers Rock," the government and national park system have returned the land to its Aboriginal owners and thus have reverted to its original name. This sandstone formation rises out of the brush like an red-orange beacon, demanding attention as the sun's rays alter the appearance of the rock from dark brown to bright tangerine. For thousands of years, Uluru has been a sacred site for the local Anangu people, and after visiting and listening to their songline stories, I've begun to understand why. It's also important to understand that because of this spiritual importance to the local people, it's incredibly disrespectful to climb the rock, though it has been done as a tourist attraction for decades. Please keep this in mind should you decide to visit Uluru - you wouldn't want someone climbing on top of your church or temple altar! The night before we were set to head north from Uluru, the area was pummeled with a relentless rainstorm, which is an extremely rare occurrence in the outback. The next morning we stood in awe of the resulting waterfalls - yes, waterfalls plummeting from the foggy top of Uluru. This is a phenomenon that happens perhaps once every decade, and I'm so thankful that I was able to witness such a spectacular event. Photos of the waterfalls (and more from my Australia trip can be found here)! Kata-Tjuta. This nearby, lesser-known rock formation (formerly known as "The Olgas") lends its name to the latter part of the national park which encompasses both rock formations called Uluru Kata-Tjuta National Park. In the local Pitjantjatjara language, Kata Juta means "many heads." From a distance, this massive rock formation looks like a gathering of god-sized heads peeking out over the horizon. Like Uluru, seeing the icon from a distance allows you to appreciate the sheer size and impact of the formation on the landscape, but a truly different experience is had when walking alongside the ancient sandstone walls. King's Canyon. This hiker's paradise is situated between Uluru Kata-Tjuta National Park and Alice Springs, and with most visitors flying between the two locations, the ancient canyon is far less visited than than some of the NT's other attractions. The loop hike covers just a little more than four miles, dipping into the lush and green "Garden of Eden" where wooden stairs descend to the cool and covered gorge floor. The sandstone rock formations appear other-worldly, and sometimes feels more like hiking on Mars than on our own planet. Arrive before the sunrise for spectacular views over the canyon as you make the climb. Culture. Countless times I've heard people say, "I've never really felt a draw to go to Australia - isn't it more or less just like the U.S.?" In a lot of ways, sure. The cities are modern and everyone speaks English (though with a delightful accent). Aside from the fact that Australians drive on the left side of the road, cities like Sydney and Brisbane could very well exist in the United States in a parallel universe. That all being said, the Northern Territory has such a unique culture of it's own, and so much of it relates to the local Aboriginal cultures of the original land owners within the NT. The surviving Aboriginal cultures of Australia are the oldest on earth - dating back at least 50,000 years, if not more. There were more than 600 distinct tribes or clans in Australia before the Europeans arrived, may with different languages, cultures and beliefs. The surviving cultures have clung tightly to their traditions and "songlines" (stories passed down from one generation to another orally, and often relate to the connection of people to the natural surroundings). The Northern Territory is one place where these cultures have continued to thrive, even while adapting to modern technologies. From original land owners I learned about traditional weapons and tools, popular songlines, Aboriginal artwork and bush tucker food and medicine (I even tasted a witchetty grub)! For those interested in learning from other cultures while they travel, I highly recommend visiting the Northern Territory. And for those interested in history, particularly in the perils of early America, I urge you to read into Australian history and the European conquest of the continent, as I'm sure you'll see many parallels between our two nations' sometimes shameful early years. The Kangaroo Sanctuary. Any animal lover need visit The Kangaroo Sanctuary in Alice Springs. The shelter was first established in 2005 as a place to nurse baby joeys back to health after their mothers were killed in automobile accidents. Kangaroo in the NT are quite like deer in the Midwestern U.S. - seemingly everywhere and somewhat of a nuisance to drivers. But Brolga, the sanctuary founder, didn't see any reason why these little joeys didn't deserve another chance at life. Now, the shelter includes baby joeys being rehabilitated for release back into the wild, as well as a reserve for kangaroos that have had too much human interaction to be reintroduced into their natural habitat. While the large male kangaroos are kept in an enclosed area, guests can wader around the acres and acres of reserve, meandering among curious (or perhaps just hungry) smaller kangaroos. Guests are educated about how to check for a baby joey in an injured or dead mother's pouch, and what to do if they ever find one (statistics say it's about 20% of the time). And let's be real - the opportunity to cradle a little baby joey in your arms is enough of a draw to visit. My trip to the Northern Territory was absolutely magical. It's such a unique place, so connected to the environment and rich in local culture. It's remote and rugged, but entirely rewarding and worth the extra travel. If you're going down under - do the outback! You won't regret it. *Disclaimer: I work as the PR Manager for Tourism Northern Territory. While this trip was work-sponsored, I was not paid for this blog post and all opinions are my own. I'll start by saying: don't spend just 24 hours in Sydney. It's such a big, interesting and beautiful urban center with different neighborhoods that hug the Central Business District from all sides - each with their own personality and points of interest. But sometimes, 24 hours is just what you get - and with my plane having landed around 8 in the morning, and a flight heading to the Northern Territory at 9:30 a.m. the next day, I had to do what I could with the time that I had. And with the help of my amazing Sydney-based client and his recommendations, I think I did a pretty good job if I don't say so myself. 9:00 a.m. - Grab a taxi into the city from the airport and check in early to your hotel room in the Central Business District. There are tons of hotels downtown at varying price points - you're sure to find a hotel that's a fit. I personally stayed at the Castlereagh Boutique Hotel, and where it was lacking in room decor it made up for in location convenience. I was right around the corner from The Strand Arcade and the Mid City Shopping Centre, which is an ideal place to shop, eat, and people watch. 10:30 a.m. - Head into your office to take a call with your clients. (Okay, only do this if you're on business and this is required of you). Otherwise, you should probably find a local coffee shop because the coffee in Australia is no joke. 11:30 a.m. - Grab an early lunch at Romolo in The Strand Arcade. You'll sit in the middle of the historic Arcade while you're served bunch and lunch favorites with an Italian/Australian twist. 12:15 p.m. - Grab a city map and make your way to Circular Quay. The main ferry docks for the city are sandwiched on the left by the Sydney Harbor Bridge, and on the right by the impressive Opera House. Even someone who tends to marvel more in mountains than man-made creations can appreciate the presence of the Sydney Opera House. Walk around the harbor for different views of these icons - and then just take a second to sit and appreciate the fact that you're in their presence. 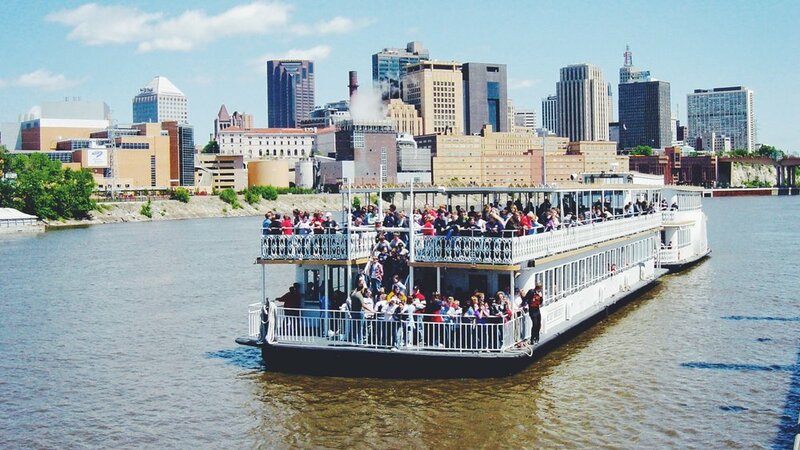 1:30 p.m. - Try your hand at public transportation and take a ferry to Milson's Point for stunning views of the harbor. You can buy an Opal card (a metro pass of sorts) and load it with as much money as you'll need to get around for the day. Tap to get on the ferry, then enjoy the view as you drift away. 2:30 p.m. - Arrive back at Circular Quay. Use your Opal card to transfer to bus 333 towards Bondi Beach. Grab a seat, put your phone down and look out the window. This route takes you through neighborhoods like Darlinghurst, Paddington and Bondi Junction before you begin to feel the vibe of a small beach town in the surf shops and acai smoothie cafes that dot the streets. Before long you'll see the ocean - and you've arrived. 3:15 p.m. - If you're at all familiar with Bondi Icebergs, you might get the same spidey-sense that I did when I hopped off the bus. I just had a feeling it might be down this little road, switching back off the main drag through Bondi. The crowds of people walking to and from may have given it away, but I came around a curve and saw it - the turquoise pool jutting out into the Pacific, differentiating itself only by slight elevation and visible swimming lanes. I'd highly recommend taking a dip if you have the time, but alas...24 hours is not much time to see an entire city! 3:30 p.m. - Continue on past Bondi Icebergs to the Bondi to Bronte Coastal Walk. This combination nature pathway and boardwalk will take you by gorgeous cliffside views and right up on living saltwater tide pools. Get up close and personal with sea snails, anenomes, and maybe even a starfish or two. 4:15 p.m. - Walk downtown Bondi Beach, taking in the Aussie beach town feel. Grab a smoothie at one of the beachside cafes and take in the street art and ocean air. Then stop into a convenience store to buy an overpriced power adapter because you totally forgot yours and you just realized it. 5:00 p.m. - Hop the bus back towards Circular Quay. You could probably grab a transfer somewhere that would get you closer to your hotel, but let's be honest - you're not really sure where you're going so let's just stick to what you know and you can walk back from Circular Quay, right? Right. 6:00 p.m. - Arrive back at your hotel room to freshen up for dinner. Answer work emails. Or don't. 7:30 p.m. - Meet your friend for dinner back at Circular Quay. No friend? DIY! There's no shame in eating solo; just pretend you're a food critic. Grab pizza and a few beers at Opera Bar, where you can watch the sun go down over the harbor. Appreciate the changing hues over the harbor bridge as the lights come up on the Opera House arches. 9:30 p.m. - Succumb to your body's need for sleep and head back to your hotel. Climb under the covers content that you've seen a good part of the city in such a short amount of time. Pat yourself on the back; promise yourself you'll be back to see more sometime. I say this as humbly as possible - I'm an incredible planner. I make lists and reservations, and think way ahead. And even I still manage to miss details and forget things (on occasion)! My most recent camping trip was a perfect example of forgetting even the most important things (WATER) packaged together with some unfortunate circumstances. But when things go wrong, and they will, you have two options: bail and go home, or make it work! And as long as the situation isn't life or death, I almost always try to make things work. I forgot water. Literally the one thing that you cannot go without, and I forgot it. Oh, I also forgot water bottles. So even if the campsite had water spickets (which it did not), we didn't have anything to physically hold the water we did not have. I also forgot pillows. I know, I know - not the end of the world - you're camping, after all! But we were comfort camping, so we had brought the air mattress and all, yet I forgot the pillows. We got rained out of our reserved campsite. I'm not talking a few sprinkles - I'm talking a hearty downpour that continued long enough to create a small stream directly through our campsite. Finally, one of our two folding chairs broke, making it unusable. It's not much fun to sit around a campfire when there's nowhere to sit. While we pondered on the possibility of surviving on the beer and wine we had packed, we ultimately decided to drive to the closest town to stock up on water. We stopped at the Idyllwild General Store and bought four giant bottles of Smart Water...and one more six pack of beer. Priorities. Our reserved campsite at the top of the mountain was getting a ton of rain, but a campsite closer to town was sitting pretty in the sun. They happened to have a few open sites left, so we abandoned our flooded plan A for a sunnier plan B. The site was great and sat right up against a trailhead, so it actually ended up working for the better! I got creative to fix our chair problem - I cut the drawstring from the chair's bag and knotted it in a way to make the chair sit-able (but not comfortable, unfortunately). Sometimes a fix is just a matter of being resourceful! After this trip, we made a camping checklist (so as to not forget the water, or pillows, again). But I'm sure there will be another mishap or unfortunate event that throws a wrench in whatever plans we've made, and then we'll do our best to salvage the trip. Camping is supposed to be "roughing it" after all, isn't it? What travel mishaps have you run into? How did you fix them? I'd love to hear from you in the comments below!